The British pound has fallen to a new historic low against the Singapore dollar as concerns mount over Britain's economy in the wake of the Brexit vote. One pound is now buying about $1.737 on foreign exchange markets - the weakest the British currency has been since at least 1981. The latest exchange rate is down nearly 13 per cent from $1.992 on June 23 - the date Britain voted to leave the European Union - and $2.085 at the start of this year. The weaker pound benefits Singapore travellers, students studying there, and local firms importing products from Britain. Singapore property investors looking to Britain also stand to gain, though they have to weigh up concerns over the future of the property market there. Persistent fears about the impact of Brexit have weighed on the British currency in the wake of Britain's vote to leave the EU. The sterling is already this year's worst-performing major currency against the greenback and it is coming under more strain in the wake of data showing how the British economy is faring after the referendum. Most recently, the currency was hit by data showing London residential rents fell for the first time in six years last month, amid worries that the Brexit vote is already having an impact on the economy. The rental data came on the heels of numbers showing that home prices fell for the second straight month. Currency analysts say the pound is expected to remain weak, given the risk of more negative economic data from Britain. Investors are waiting to see if the Bank of England's (BOE's) latest economic stimulus efforts prove effective, said Phillip Futures strategist Bryan Lum. The negative sentiment, however, has been hard to shake as investors have turned sceptical about such policies. MR BRYAN LUM, Phillip Futures strategist, on the Bank of England's economic stimulus efforts. The BOE expanded its bond-purchasing programme earlier this month and also cut interest rates for the first time in seven years, in a bid to support the economy. "The negative sentiment, however, has been hard to shake as investors have turned sceptical about such policies," said Mr Lum. Credit Suisse senior investment strategist Heng Koon How said the pound is expected to trade between $1.70 and $1.75 in the coming months. However, the currency could sink even further than that if economic prospects continue to weaken, he noted. 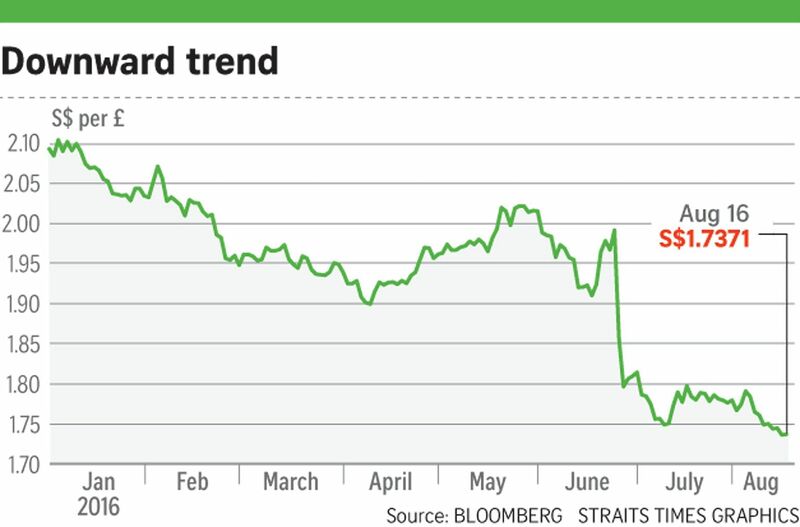 It is "difficult to see any rebound" for the pound and any uptick is likely to be temporary, added Mr Heng.